You can make different flavors of gum drops by using different fruit juices and food colors. Use you imagination and be creative! 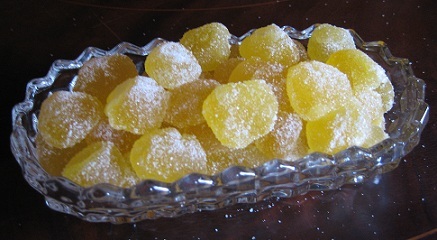 I have to warn you, these lemon gum drop candies are very sweet and addictive! A delicious way to satisfy your sugar addiction. This candy will definitely put a smile on the faces of adults and children. Line a 9-inch x 5-inch loaf baking pan with aluminum foil. Lightly spray with non-stick cooking spray. In a large heavy saucepan over medium-low heat, add the lemon juice, fruit pectin, and baking soda. Bring just to a boil (the mixture will foam up vigorously), then reduce heat to low (do not let the mixture boil again), and keep on the low heat. In a medium-size saucepan over medium-high heat, combine sugar and corn syrup, stirring constantly, and bring to a boil. Once the mixture comes to a boil, stop stirring, and let it boil until it reaches 280 degrees F. (soft-crack stake) on your candy or cooking thermometer. If you do not have a cooking thermometer, you can test the candy by dropping a small amount of the candy mixture into cold water. The candy is ready when it separates into hard threads that are not brittle. Carefully and slowly pour the hot sugar/corn syrup mixture into the the hot juice mixture, stirring constantly (this will take a couple of minutes). When the two mixtures are combined, remove from heat and add the food coloring (if using). Let the mixture stand for 2 minutes, then skim off any foam (if there is any) from the surface. Pour the candy mixture into the prepared pan. Let sit at room temperature, uncovered, for at least 12 hours or overnight. Lift aluminum foil from the pan and remove foil from the sides. Cut the gumdrops into 3/4-inch squares with a knife dipped into sugar. Roll gumdrop squares in sugar. NOTE: They will be sticky. I ended up having to roll them in my hands and then in the sugar. Let stand uncovered at room temperature for 1 hour. If desired, roll in additional sugar. NOTE: As they still were a little sticky, I placed them in the refrigerator. Store gumdrops in an airtight container in the refrigerator in a single layer. Apple Gum Drops: Substitute apple juice and use red or green food coloring. Orange Gum Drops: Substitute fresh-squeezed orange juice and use 4 drops yellow food coloring and 1 drop red food coloring. Grape Gum Drops: Substitute grape juice and use 2 drops blue food coloring and 2 drops red food coloring. Pink Grapefruit Gum Drops: Substitute pink grapefruit juice. how long do these last at room temperature? I recommend keeping your homemade gum drops in the refrigerator to keep the texture nice. If left at room temp… are these softer like Aplets or firmer like a gummy bear?